Tyler is a California native and moved to Virginia Beach after graduating from William & Mary Law School. 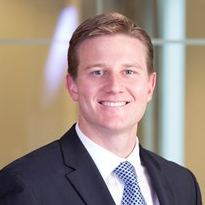 He is an attorney at Williams Mullen where he represents clients in a wide range of commercial real estate matters, including acquisitions, sales, leases, financings, and environmental issues. Prior to law school, Tyler started developing his East Coast roots and fleet feet at Dickinson College where he played football and baseball. He was an English and Economics major in college and did not take any formal dance classes. Tyler enjoys being involved in the community and exploring everything Hampton Roads has to offer. Tyler is actively involved in CBDX, the young professionals division of the Central Business District Association of Virginia Beach, and regularly volunteers for Neptune Festival events. Tyler’s dancing strategy for many years has been to “dance like there’s nobody watching.” Although deviating slightly from this strategy tonight, Tyler is thankful to all of you watching this wonderful event and supporting the Virginia Musical Theater. Tyler would also like to thank Williams Mullen for the sponsorship and his dance partner, Allie, for her patience.